This is our electronics corner. Aptly named “Tesla”. Which nicely fits the theme set by LoTHR, OLGA and MaSha. Examples for other names of corners or rooms in realraum. Additionally Tesla himself was from Serbia/Austria and even studied in Graz, so there you go. Observe the power supplies on the right and top-left. Plugged in and ready to use. No need to move it around. 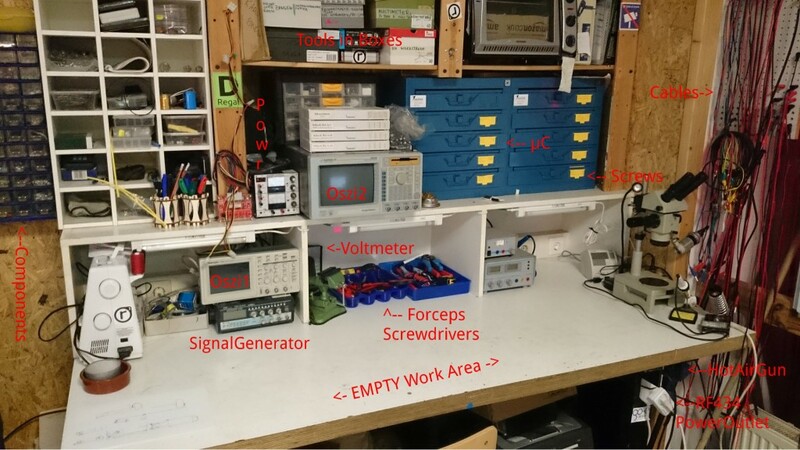 See the oscilloscope and Signal-generator to the left as well as the nice 4 Channel oscilloscope on the top. All plugged in, ready to use. Keep them there. See the pens and pencils on the top-left. Use them, put them back. Microscope and soldering irons to the right. Hot-Air gun in holder on the right below the table. Quickly unholster and use, then put it back.